The military team that killed Osama Bin Laden is an elite special forces group unofficially called SEAL Team 6. Officially, the team's name is classified and not available to the public, technically there is no team 6. A Tier-One counter-terrorism force similar to the Army's elusive Delta group, Team 6's mission rarely make it to paper much less the newspaper. It shows how important the publicity about Bin Laden's killing is to the U.S. that this morning, Team 6 is front page news. The members of Team 6 are all "black" operatives. They exist outside military protocol, engage in operations that are at the highest level of classification and often outside the boundaries of international law. To maintain plausible deniability in case they are caught, records of black operations are rarely, if ever, kept. The development of SEAL Team 6 was in direct response to the 1980 attempt to rescue the American hostages held in Iran. The mission was a terrific failure that fell apart at many points and illustrated the need for a dedicated counter-terrorist team capable of operating with the utmost secrecy. 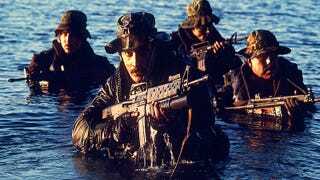 The Team was labeled 6 at the time to confuse Soviet intelligence about the number of SEAL teams in operation at the time. There were only two others. Team 6 poached the top operatives from other SEAL units and trained them even more intensely from there. Even among proven SEAL's the attrition rate for Team 6 is reported to be nearly half. There are no names available for current Team 6 members, but the CIA does recruit heavily from their numbers for their Special Operations Group, so it makes sense that they were chosen to work with the CIA on this mission. Team 6 is normally devoted to missions with maritime authority: ship rescues, oil rigs, naval bases or land bases accessible by water. There are no waterways near Bin Laden's compound. To check out our full coverage on the successful raid of Osama Bin Laden's compound—from the planning to the aftermath—head here.